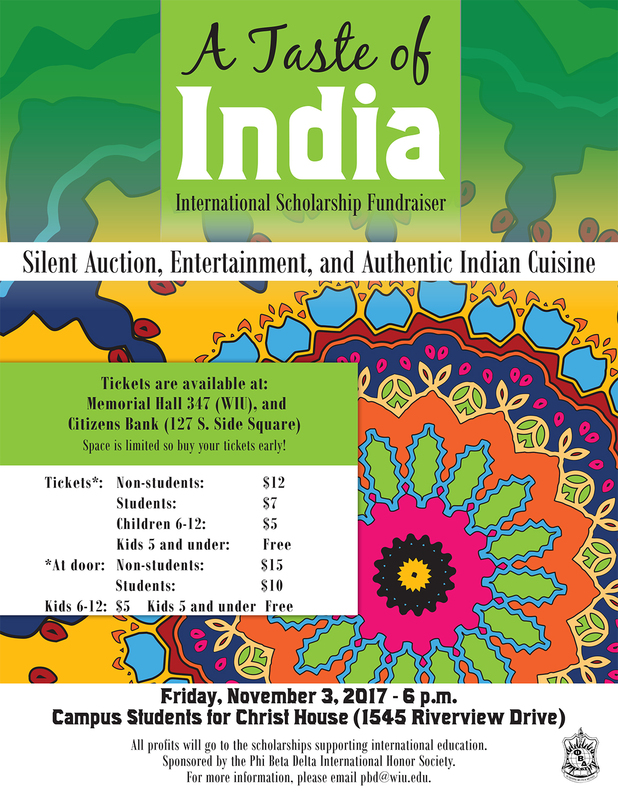 MACOMB, IL -- The Western Illinois University chapter of Phi Beta Delta, an international honor society, will host its fifth annual scholarship dinner themed, "A Taste of India," at 6 p.m. Friday, Nov. 3 at the Campus Students for Christ House, 1545 Riverview Dr., Macomb. The fundraiser will feature a silent auction, entertainment and authentic Indian cuisine. All proceeds benefit scholarships supporting international education at Western. Two scholarships of $500 each will be awarded; one to a WIU student studying abroad and one to an international student at WIU. Tickets for the scholarship dinner are available at Memorial Hall 347 and Citizens Bank on the Macomb square. Advance tickets for students are $7 in advance or $10 at the door. Tickets for non-students are $12 in advance or $15 at the door. Tickets for children ages 6-12 are $5 and children ages 5 and under will be admitted free. Space is limited, so early ticket purchases are recommended.